Capri, Positano, Ischia, Procida, Sorrento, Amalfi, Napoli, Li Galli sono solo alcuni dei luoghi più belli del mondo che hanno sparato la fantasia e ispirato poeti, pittori, musicisti, scrittori e così via. La barca è parcheggiata nel porto di Castellammare di Stabia, strategico e la posizione centrale per visitare via terra anche Pompei, Ercolano e Vesuvio. Ben servito da tutti i mezzi di trasporto: autobus e FS; Il porto si trova nel centro della città, tutti i servizi sono raggiungibili a piedi. Nelle vicinanze si trova la stazione marittima del Metrò del Mare dal 10 luglio offre collegamenti rapidi a: Napoli, Capri, Sorrento, Positano, Amalfi, Agropoli, Acciaroli, Palinuro, Marina di Camerota e altri. Se lepre nostalgia per il fresco, non c'è problema: circa 500 m c'è una funivia che, in pochi minuti con un viaggio spettacolare vi porterà sul monte Faito a 1000 metri sul livello del mare, dove si gode una vista mozzafiato. Servizio di trasferimento € 50 dall'aeroporto o dalla stazione ferroviaria di Napoli (andata e ritorno € 100). Soggiorno minimo 2 giorni 2 pax. La barca ha tre cabine doppie che verranno utilizzate una volta ogni due persone, la terza cabina sull'arco è per il comandante, il tavolo nel soggiorno può diventare un letto matrimoniale, sarà disponibile se gli ospiti sono più di quattro. Quando sei a bordo la barca sarà ad uso esclusivo, Skipper sarà a bordo solo quando la barca è fuori dal porto di Castellammare. Cucina con forno, frigorifero, acqua calda, doccia interna ed esterna. TV con USB, stereo, wifi. Captain Nicola was amazing. This was definitely the highlight of our trip to Italy. Three days on the boat and he went out of his way to make the visit very special. We will never forget it. If you want to see the Amalfi coast and Capri by private boat, he is your guy. Knows everyone and speaks great English. Can’t thank you enough Nicola for a wonderful cruise. Can’t wait to return. Hope you enjoyed the Kentucky Bourbon and the cigars. This was our second time sailing with Captain Nicola.That should tell you everything. We enjoyed our first trip so much we returned, this time bringing our 16 year old granddaughter with us. His new boat is comfortable and more spacious than the last, we had a great time sailing and swimming, Nicola is fun and interesting to talk with, all in all a perfect two days. Best relaxing holiday, being rocked gently to sleep at night, taking in the stunning views each day. The boat is moored in the quiet port of Castellammare di Stabia. Hardly any other tourists in this authentic Italian town. Captain Nicola was the ultimate host. His boat is imaccularely kept with everything and more you could need. Going out to sea with him was an experience to never forget. A wonderful man with a love for people, the area and the sea. My family and I can not wait to join him again, hopefully soon. Our time on the Kala Nag, docked in the historic (non-touristic) port of Castellammare di Stabia, was a refreshing break from hotels and B&B's. Nicola greeted us at the train station, gave us a quick driving tour of places we would need to know to make our stay comfortable (...like the best pizza we ate in 2 weeks! ), and introduced us to our "quarters." Then, the boat was ours, and he only appeared as agreed to take us out on excursion. There is no crime in the town, and the dock employs a 24 hour watchman. Living on a boat is tight quarters, but beyond that, it could not have been more comfortable. Everything from bedding to kitchen to bathroom, to spacious table area is in tip top shape and immaculately clean. The care that Nicola takes of his boat is to be admired, yet he was relaxed about us making ourselves at home, once we knew the "ground rules." Everything we needed, including the train station, was an easy walk from the boat. We traveled one day by train (20 minutes) to Pompei. Sorrento is also within short train ride. One day, weather permitting, we scheduled a trip to the isle of Capri. Nicola is a skilled, experienced, knowledgeable captain and an interesting, caring, and fun person. His interest in our stories was genuine, and we thoroughly enjoyed hearing his. We learned much about the shoreline and its history. We have only one regret, and even that was not the fault of Nicola. We were passionately looking forward to sailing, but the day we left harbor, the entire trip was motor. The wind was not strong enough to sail. Because we had failed to ask questions, we left thinking any minute the sails would go up. A huge let-down, but totally our fault. Nicola is trustworthy and honest...and his English is great. A simple conversation would have avoided the misunderstanding. We highly recommend a stay on the Kala Nag. The entire three days was a delight. I'm sorry I gave you a little disappointment, i love to satisfy all my guest request. Unfortunately i can't control wind and weather but If you would have told me that you preferred to use the sails I would have tried to settle, but certainly we would not be able to go to Capri. 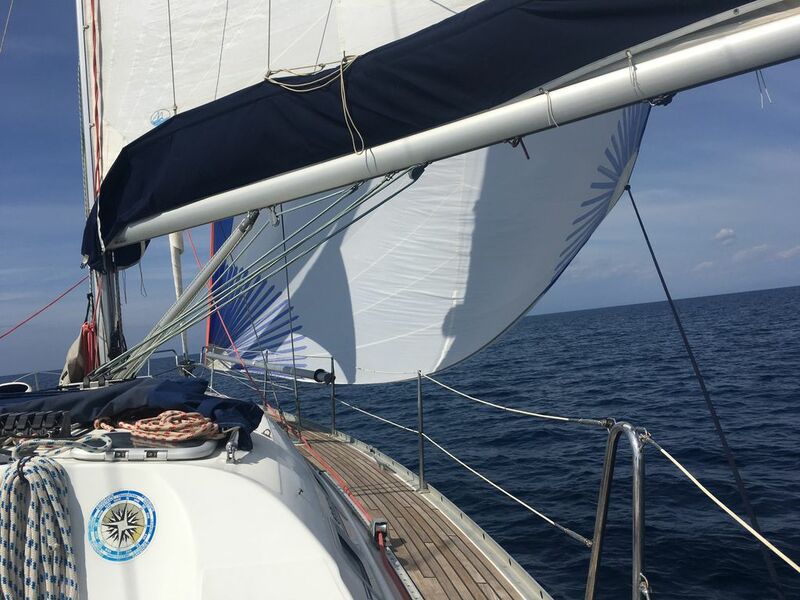 I prefer to point out for the benefit of future guests, on a sailboat, if you are not lucky enough to find the right wind (rare) must choose whether to sail or reach the goal with the required times.